For the second consecutive year, NED has funded programs in six strategic areas that help democrats respond to the threat posed by resurgent authoritarianism. 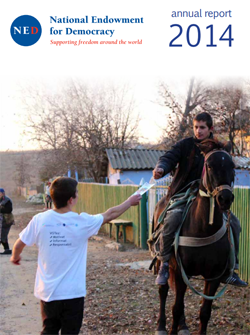 The 88 strategic programs that NED supported in 2017 have included: Helping Civil Society Prevail Against the New Repression, Defending the Integrity of the Information Space, Combatting Modern Kleptocracy, Strengthening Democratic Unity in Defense of Democratic Standards and Values, Fostering Ethnic and Religious Pluralism Against Extremist Movements and Strengthening the Capacity for Democratic Governance. 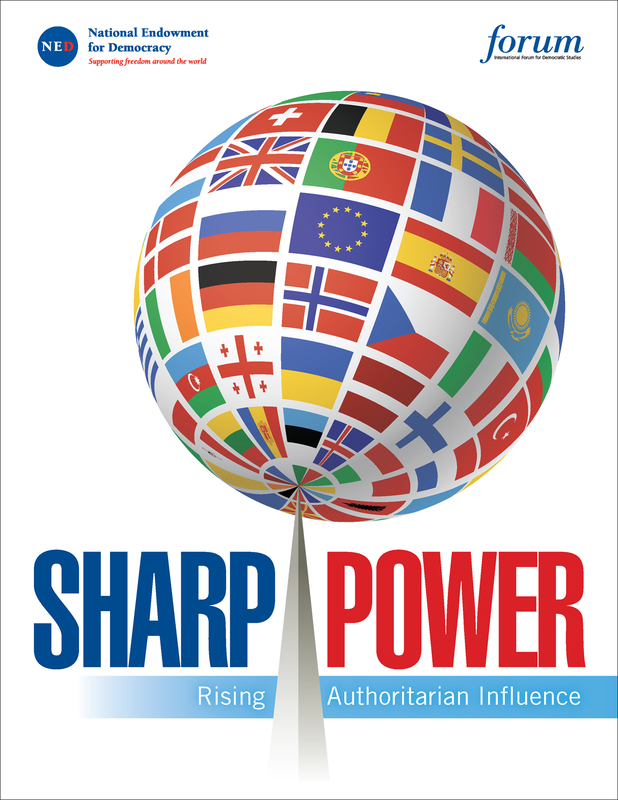 “Sharp Power: Rising Authoritarian Influence,” a new report published by the International Forum for Democratic Studies, examines Chinese and Russian influence in four young democracies in Latin America and Central Europe. 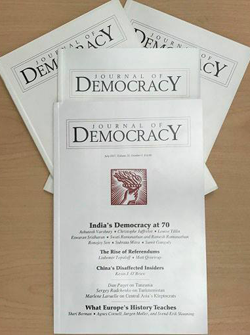 For more than twenty years, the Journal of Democracy has been a leading voice in the conversation about government by consent and its place in the world. 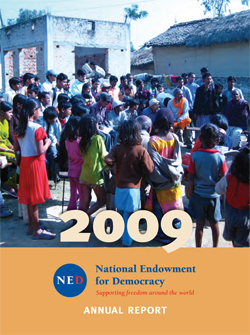 The Journal is published for the National Endowment for Democracy by the Johns Hopkins University Press and is available to subscribers through Project MUSE. 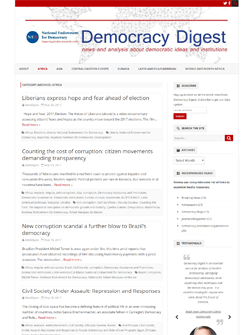 Democracy Digest is the blog of the National Endowment for Democracy, providing news and analysis about democratic ideas and institutions, human rights, civil society, authoritarianism, and related issues. 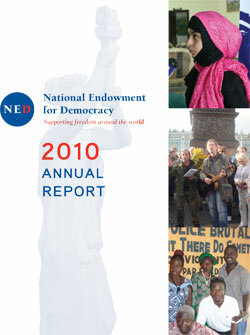 NED’s principal task during the last year was to analyze the new threats to democracy, work with its core institutes and the NED Board to shape a strategic plan of action, and begin to implement that plan by making “strategic” grants supporting programs to press back against the authoritarian resurgence in the hope of giving new momentum to the global fight for democracy. 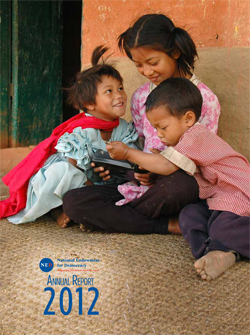 2014 marked another challenging year for freedom and democracy. 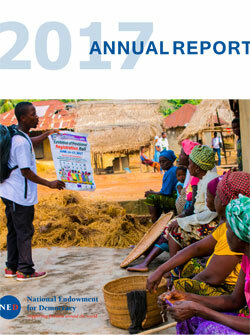 As measured by Freedom House, nearly twice as many countries suffered declines as registered gains in political rights, civil liberties and other democratic standards. 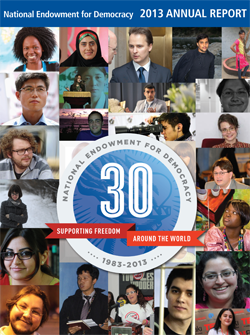 In 2013, the National Endowment for Democracy celebrated 30 years of supporting freedom around the world. NED marked the year 2012 with celebrations of three key milestones: the 30th anniversary of President Reagan’s Westminster speech that helped launch the idea of a bipartisan institution to advance democracy abroad; the 10th anniversary of the Fellows program named for President Reagan and former congressman Dante Fascell, who had called for establishment of a NED-like body back in the 1960s; and the 5th anniversary of NED’s Center for International Media Assistance. 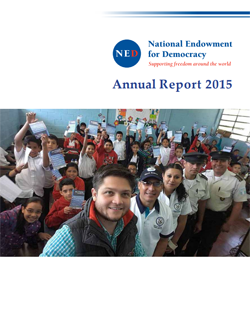 While responding to the Arab Spring was a priority for NED in 2011, the organization maintained a robust global grants program, with support going to aid democratic efforts in more than 100 countries. 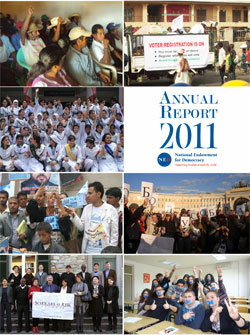 While democracy regressed in many parts of the world and the curbs on NGOs remain a real threat, 2010 has been a year in which civil society and democracy activist have demonstrated impressive levels of vitality and adaptability, and even made progress against authoritarian forces in forbidding circumstances. 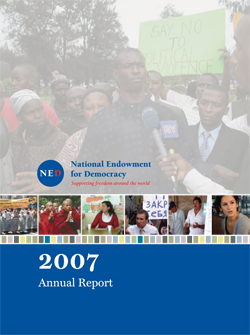 The 2009 report reinforces the axiom that democracy is an incremental process, rarely arriving overnight thought a single dramatic event, but rather developing over time through effective groundwork laid at the grassroots. 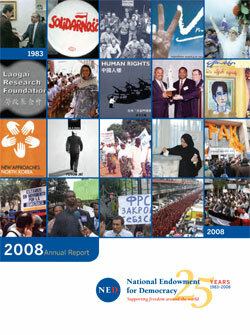 The 2008 Annual Report highlights much of the day-to-day work of the many democrats working in every corner of the globe. 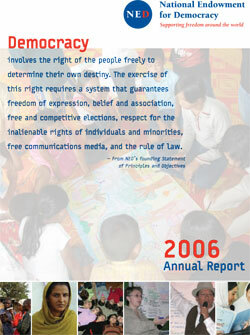 The programs in this 2007 report offer only glimpses of well over a thousand inspiring and instructive stories of patience, hard work, creativity, and above all, commitment to the ideals that will determine the long-term democratic development of societies world wide. 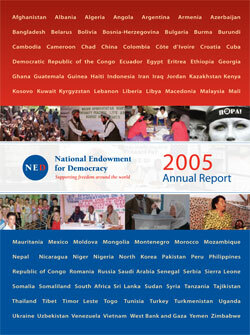 During 2006, NED and its grantees responded to resistance with an eye toward regaining the forward momentum for democratic progress. 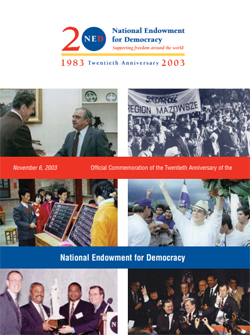 In 2005, the world’s attention was focused upon democratic advances in the Middle East, as Iraqis and Afghans risked their lives to participate in democratic processes once though unimaginable in their countries. 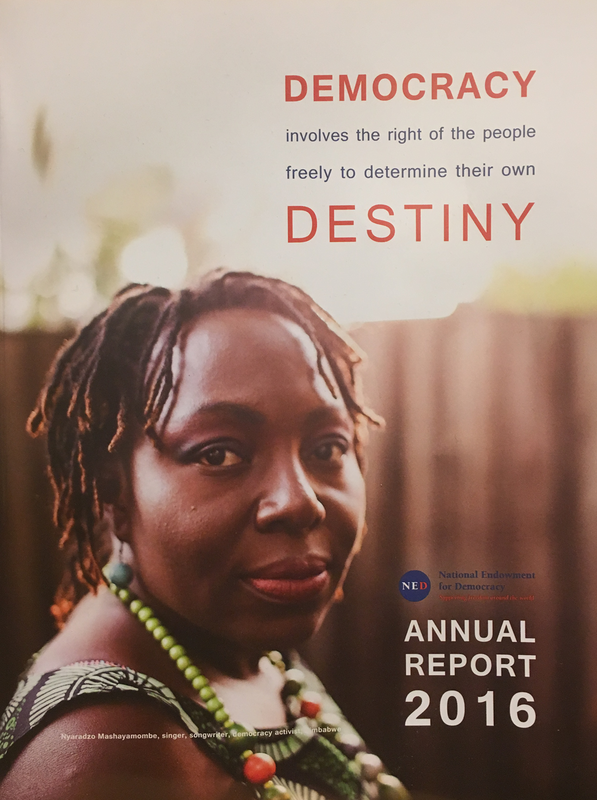 But in every corner of the world there were remarkable individual , their stories virtually unknown, who were also advancing the principles of freedom, democracy, and human rights. Read through important NED documents.